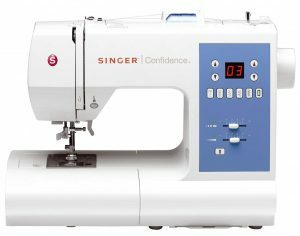 Read this post and you’ll be a sewing-machine-pro in no time, ready to make the decision which sewing machine has the pleasure to be yours. With no further delay, let’s get started! Think about the long-term when making your choice. What projects do you want to tackle in the near future? 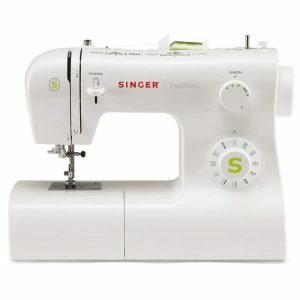 You buy a very basic sewing machine which doesn’t have a lot of features. You sew a cushion cover and some other beginner projects and you’re totally happy with it. After a few weeks, you start with dressmaking and you realize that you really struggle with the buttonholes. After a bit of research, you come across a sewing machine which has an automated buttonhole function and you regret your initial purchase. This is the kind of situation we want to avoid, right? How can you do this? By thinking about the different features your sewing machine should have. Continue reading to find out more. Another tip💡: check out what else the box contains. For example, a zipper foot will be super helpful when trying to insert a zipper. If that’s already included in the box, then there is one less thing to worry about at a later stage. 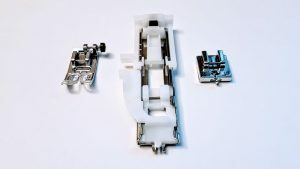 Example of different feet: a standard foot, a buttonhole foot and a concealed zipper foot. What’s the intended purpose? 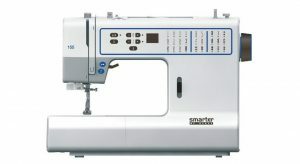 Do you want to use the machine for dressmaking, craft projects or basic repairs? The features that are important for you vary depending on this. What’s your level of expertise? An easy-to-use machine is great for beginners. You can start sewing without spending hours trying to understand that complex thing in front of you☺️ However, a professional probably wants more features, no matter the complexity. Pro tip💡: put together a list with all criteria. For example, if you want to be out and about with your sewing machine, it is likely gonna be important to you that the machine isn’t too heavy. For someone who just wants to sew at home, this might be irrelevant. 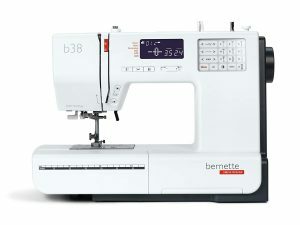 Before making a final decision, make sure to try out some sewing machines to have a better comparison and to be 100% sure what you’re about to buy. It’s important that you test the sewing machine you’re aiming for. How well can you read the LED display? Is it easy to change settings and features? Is the weight of the machine ok? How quiet or loud is the machine when you sew? How does the machine react to the foot pedal pressure? Does the machine sew well when you have multiple layers or a thicker fabric? Try different features and controls. Is everything working well? What else is included in the price, e.g. cover, zipper foot, needles? Does the machine feel like a good fit – not just now but also in the near future? If the machine becomes damaged, can you drop it off for the repair near you? Did you know that there are different sewing machine types? 4 to be precise. Why is this important for you? Because you want to get a machine that meets your expectations and fits your sewing needs and ambitions💡 And believe me, the differences between them are huge as you’ll see shortly. So let’s take a quick look at them. 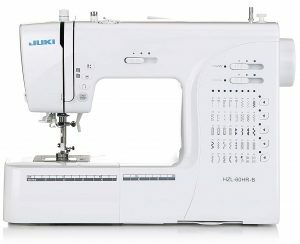 This is the most basic sewing machine you can get. It needs a bit of man- or rather women-power as you need to control basic settings manually💪. For instance, you need to use the hand wheel to move the needle and bobbin. Also, features are rather limited. Such a machine might be an option if you’re an occasional sewer without any ambitions to do much more than simple crafts projects and basic repairs or if you’re on a strict budget (even though some models qualify as legendary or vintage in the meantime and are therefore expensive again🙈). 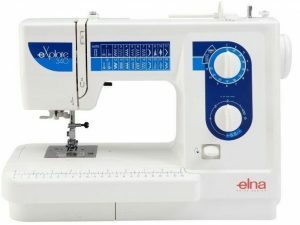 I’ve got an electronic machine myself – a Janome CXL301 – and I’m super happy with it (check out my review here). They are easy to use and great for beginners, intermediate and advanced sewers alike👍There are many others too, such as the singer sewing machine in the picture or the one’s I’ve listed below for you. Want something fancier and tech-forward? Then go with a computerised machine🌟 It can be connected to the internet, memorise your past work and give you such a wide selection of stitches that you won’t be able to make a decision. You operate it via a touchpad (of course) and you can even download patterns. Computerised machines are great for professional sewers and/or industrial purposes, for example for a smaller fashion label to make its own collections. Overlockers can be used in addition to your regular sewing machine to give your project a professional finish💁‍♀️ It neatens your seam, finishes your edges and even trims any excessive fabric while you sew. However, due to its limited functions, it can’t be used on its own. make sure the machine meets your expectations. For example: one sewing machine provider might focus on quality while for another brand, affordability is key. Depending on what’s more important for you, you can make an informed decision. Bernina is a Swiss sewing machine manufacturer, backed by tradition. In fact, Bernina is a family business, celebrating its 125 years anniversary this year (Happy Birthday, Bernina🎂). They focus on the highest standards of quality and Swiss precision down to the last detail. As a high-end brand which ensures quality, it’s also on the more expensive side compared to other brands. 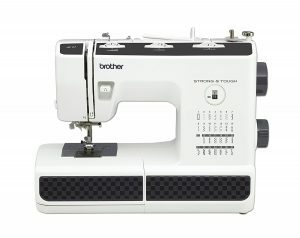 Brother offers a wide range of products such as printers, scanners and, of course, sewing machines. In fact, this is how it all began. The company started in 1908 with the repair of sewing machines and the rest is history. 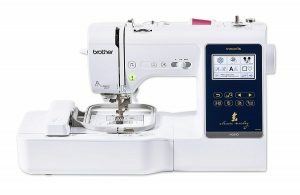 The Brother sewing machines are competitively-priced and stylish💁‍♀️ Brother got you covered no matter what kind of machine you’re looking for thanks to their comprehensive product portfolio. You won’t believe this, but Husqvarna was originally a Swedish royal arms factory founded in 1689, so 330 years ago. They had to reinvent themselves when the demand for rifles started declining in 1872. 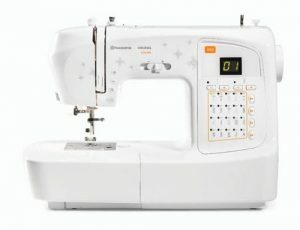 Luckily, they decided to manufacture a more peaceful product going forward and entered the sewing machine industry😊 Nowadays, Husqvarna Viking designs high-quality sewing machines in Sweden and stands for durability and reliability. I’ve got a Janome sewing machine myself and I absolutely love it. 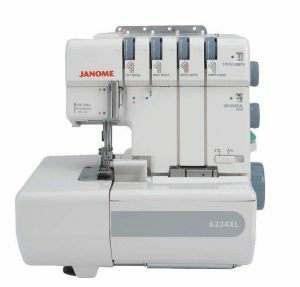 Janome is one of the biggest brands worldwide and offers a wide range of sewing machines, all of them designed so that they are easy to use which is especially great for beginners. My machine, for example, has a speed controller, so that I can sew as fast or slow as I want to💁‍♀️ The brand is known for its quality, reliability and affordable prices. Once upon a time (in 1862 to be precise), Georg Michael Pfaff has built his first sewing machine ever and with that, founded the company. Their slogan “perfection starts here” reflects the company’s premium position in the market. Superior performance and constant modernisation are core values from Pfaff. The Singer story started in 1851 with a patent on the first practical sewing machine handed in by Isaac Singer. The company has kept this inventive spirit over the years and can be proud of many innovations, such as the world’s first zig-zag machine or the first sewing assistant app💡. 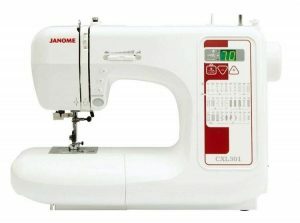 The machines have a practical design and are developed for every level of sewing. Maybe someone tries to get rid of the machine you’re looking for, so check out some second-hand websites like Gumtree or eBay. If your birthday or Christmas is not too far away, inform your loved ones about your sewing machine wish🎁 I’m sure they will appreciate as well if they don’t have to worry about what to get this year. Ask the seller if you could buy the exhibition sample for a reduced price. 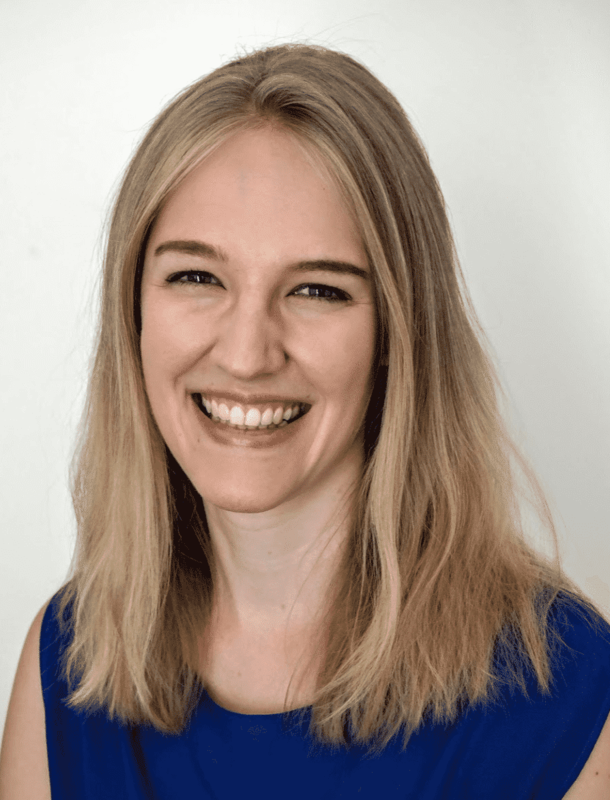 The right time to bring in your negotiation skills! Ask if a sale is coming up or wait for the ‘classic’ sales periods (e.g. after Christmas🎄and Mother’s Day). It could also be worth waiting until the brand releases a new model as they might lower the price for the other machines at this stage. If all else fails, I usually give it one last shot and search online for a coupon. You never know, maybe you’ll be lucky! Once you bought your machine, put it on an online marketplace platform like Fat Llama so that other people can rent it. With that, you can recover a part of the costs or if you do it long enough, maybe even make a profit. on how to save money.